Eliza Hamilton George was born in Bridgeport, Vermont, in 1808 and married W. L. George before coming to Fort Wayne sometime prior to 1850. In that year, one of her daughters, also named Eliza, married another young newcomer to the city, Sion Bass, who had arrived from Kentucky in 1849. Sion Bass joined the army in 1861 at the outbreak of the Civil War and helped to organize the 30th Regiment of Indiana Volunteers; he was chosen to be its first commander. At the battle of Shiloh in April 1862, Sion was killed leading a charge of his regiment against Confederate lines. The loss of her son-in-law and the news of the terrible suffering of Union soldiers everywhere made a great impression on Mrs. George. Early in 1863, at 54 years of age, she applied for duty in the Sanitary Commission, the forerunner of the Army Nurse Corps. Her value as a nurse was quickly realized in the rapidly overflowing hospitals in Memphis, her first duty station. Here she soon was commended enthusiastically by those for whom she worked, from the beleaguered doctors in the field to Indiana’s Governor Oliver P. Morton. Her special care of the soldiers caught the imagination of the Indiana press as well. An Indianapolis newspaper, for example, told of the occasion she sat for twenty hours with a young frightened soldier, holding ice against his bleeding wound. Whenever she tried to have some one relieve her, the boy so painfully begged her to stay that, “she forgot her own weariness and applied the ice again.” When shells were falling in and around the hospital tent, she picked up the wounded and, one by one, in the face of enemy fire carried them in her arms to safety. 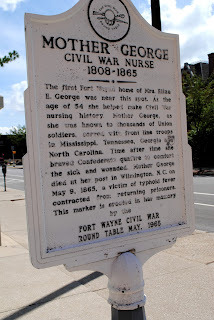 Near the end of the war, “Mother” George – as she had come to be called affectionately by the soldiers – was assigned to the army hospital in Wilmington, North Carolina. There, at the same time, came nearly eleven thousand newly freed Union prisoners of war. 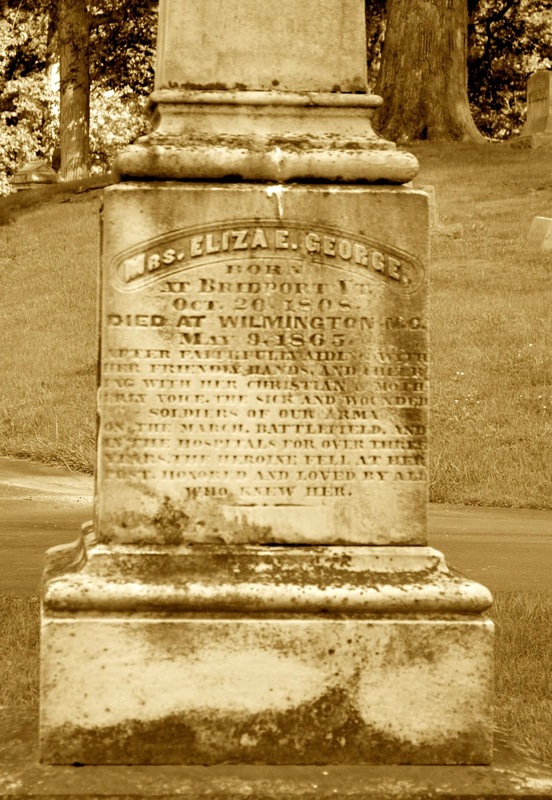 Mother George gave herself completely to relieve the suffering of these men, but in an outbreak of typhoid among the troops, the exhausted Mother George contracted the disease and died on May 9, 1865, scarcely a month after the end of the war. Her body was brought back to Fort Wayne where she was buried with full military honors in Lindenwood Cemetery, the only woman to have been so honored there. 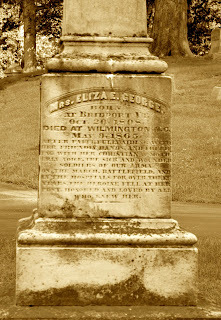 Later that same year, the Indiana Sanitary Commission and the Fort Wayne Ladies Aid erected a monument in her memory in the cemetery. A weathered granite shaft with the simple inscription on its face that reads, “Mrs. George” still stands in a triangular space near her actual grave site across the way in the Col. Sion S. Bass family plot. To honor the memory of Eliza George, however, a marker was placed on the north side of East Berry Street between Barr and Lafayette that is near the site of her first home in Fort Wayne. It was erected in May of 1965 by the Fort Wayne Civil War Roundtable. Prior to the Civil War, Eliza George moved in with her daughter and son-in-law at 509 West Washington. It was an address she or Sion Bass would never return to and live out their otherwise promising lives. Mother George died never to know of her great fame or of a legacy placing her among the important women contributors to American history. Scheduled for December 2006 but Published February 2007.